Jerome Wetzel TV: A Matter of TRUST. Article first published as TV Review: TRUST on Seat42F. FX’s newest anthology series is TRUST. No, it’s not another Ryan Murphy production, though you should be forgiven for thinking so, given the network and similarities. 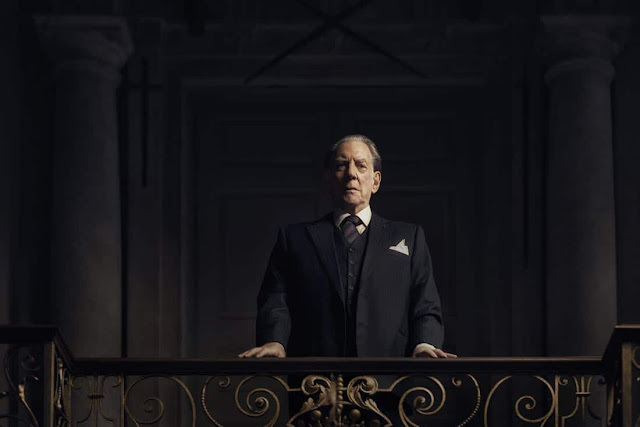 TRUST., created by Simon Beaufoy and directed by Danny Boyle, concerns the Getty family, an infamous clan of oil tycoons, the head of which was once considered one of (if not the) richest man in the world. The first season’s ten-episode run specifically covers the kidnapping of the patriarch’s grandson, J. Paul Getty III, in the mid-1970s. Subsequent seasons are expected to show other periods in the family’s history. The first hour, which premiered last night, is essentially an introduction to the main guy, J. Paul Getty (Donald Sutherland, M*A*S*H, The Hunger Games), his relationship with his sons, and a brief encounter with one grandson. It does a solid job illustrating the unrest in the family, and how J. Paul Getty sees J.P.G. III (Harris Dickinson, Clique) as the last chance to pass his dynasty on to his heirs. When III disappoints his grandfather in a major way, as the senior’s children have before, the old man is furious. He casts III out, without care for the debt the younger man owes some very bad people. This is the set up for the kidnapping. The Gettys are a real family, but much license is being taken with their story. Trying to trace various family members and their relationships, it seems the timeline doesn’t quite add up to real life. One family member is even suing the production, say it’s extremely inaccurate. It’s hard to know what TRUST. gets right or wrong, but the credits do admit that some things have been changed and personalities combined, so while it’s entertaining, I wouldn’t necessarily take it as a history lesson. There are quite a few good actors in TRUST., including Michael Esper (Nurse Jackie), Brendan Fraser (The Mummy) and Hillary Swank (Million Dollar Baby). But in the pilot, it’s a two-man show. Sutherland hasn’t lost a step with age, simmering as the sleazy mogul, showing both the reprehensible parts of the personality and his vulnerabilities. Sadly, there are few redeeming qualities, but as despicable as the man is in this show, Sutherland is still immensely watchable. Dickinson matches him in the less central, but vitally important, role, which is only slightly more likeable. There seems to be quite an appetite for ‘true stories’ of scandals recently. TRUST. should nicely add to the offerings of that genre. It’s well produced, well directed, and the sets are amazing. It’s a big production for a very personal story, the trappings of wealth not making the characters less vulnerable to reality. If anything, it makes them more so. As separate as they are from everyone else, and as outlandish and hard to relate to as some of the things they do may be, there is definitely a core story that will resonate, true or not, with many viewers. The disappointing thing about the rumored second season, which TRUST. seems sure to get with material this good that fits perfectly on the network, is that Sutherland won’t be as front-and-center, as supposedly we’ll see J. Paul Getty coming up, some forty years before the first run. One can only hope they tell the story in flashback, with framework sequences involving Sutherland. I don’t normally like this conceit all that much, as it’s overdone and usually unnecessary. But Sutherland is a big part of why I would recommend this show, so I would hate to lose him from the series. And whoever fills his shoes will have to be most impressive indeed. TRUST. airs Sunday nights on FX.